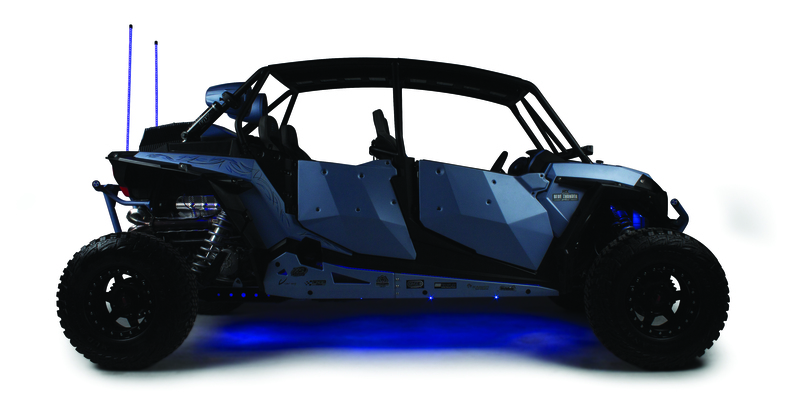 Our team of professional builders took upon themselves to even outdo their best work with this latest creation, a 2015 RZR XP1000 Turbo, that has what I would say is the loudest and practical system ever put into a RZR. 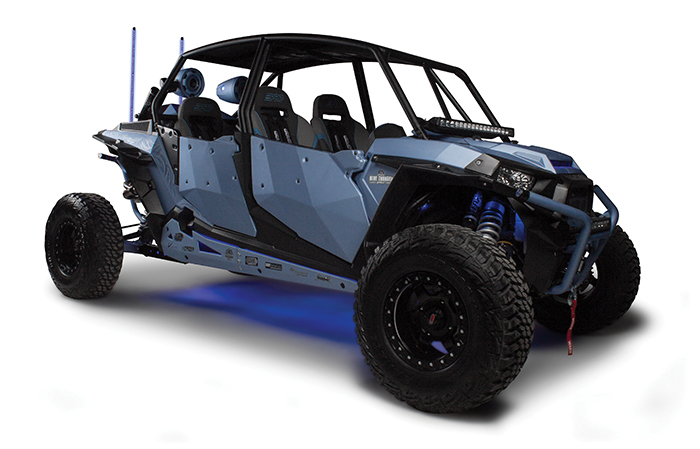 This entire machine is customized, from the upgraded suspension, wheels, tires, lights, and all the usual stuff that enthusiasts love to change out on their rides, but the system is no off the shelf solution. Twitchy and crew started by removing the factory dashboard throwing it in the trash. 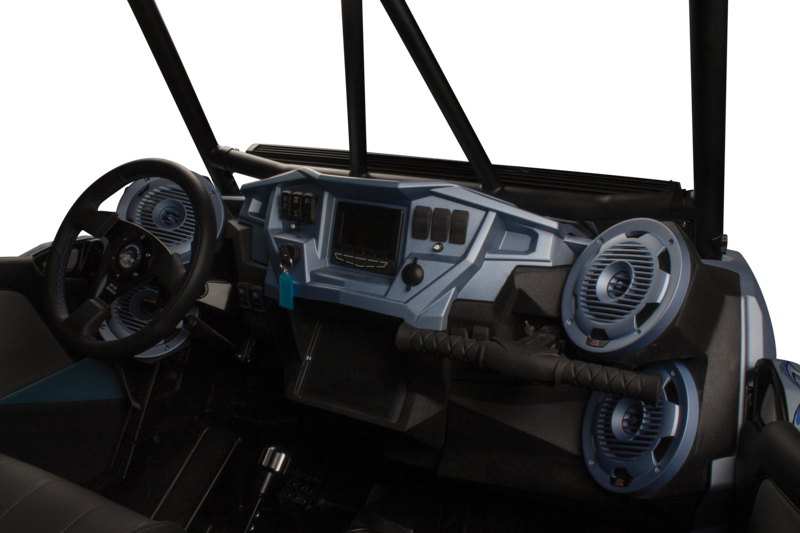 They then set about sculpting a completely custom dashboard that includes FOUR 6.5" all weather speakers built into the dashboard without losing any other functionality or indicators. Next they stuffed two 10" subwoofers under the dash to add in that low end that makes music fun to watch. For most that would have been good enough, but since when is good enough really enough?" The team then added two WET8CWB, 200-watt compression driver cage mount loudspeakers, to the roll cage facing to really turn the volume up and to make sure that everyone within earshot can hear the party. 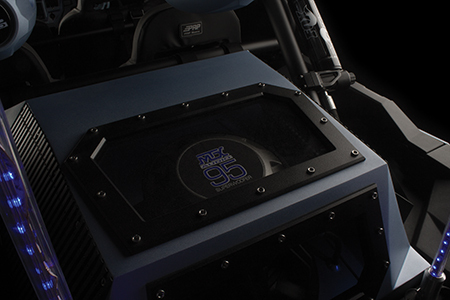 On top of that, they integrated a fully customized aluminum subwoofer enclosure for a single 15" 95 Series subwoofer in the cargo area for an extra boost of holy bass!. But of course you cannot have loudspeakers and subwoofers without amplifiers so what did we do to power all this music making fun? 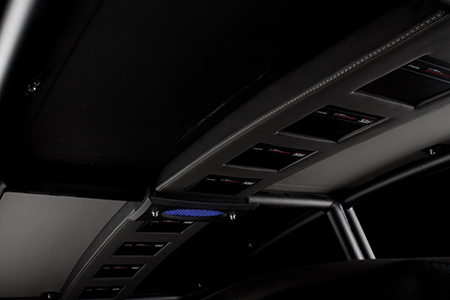 Well we started with two THUNDER1000.1 class D amplifiers mounted under the front seats to drive the three subwoofers. Then we integrated eight of the MUD100.2 full range all-weather micro amplifiers into the roof of the vehicle, keeping them out of harm's way but making a really cool effect. Thank you to all our industry friends that help us put this bad boy together, Polaris, XSPOWER (batteries), CageWrx (cage and roof) VARAD (lighting), Kanati (tires), PRP (seats and seat belts interior materials) and of course or friends at Polaris.